The hunter arrives in an isolated community in the Tasmanian wilderness with a single purpose in mind: to find the last thylacine, the tiger of fable, fear and legend. The man is in the employ of the mysterious 'Company', but his sinister purpose is never revealed and as his relationship with a grieving mother and her two children becomes more ambiguous, the hunt becomes his own. Leigh's Tasmania is a place where the wilderness can still claim lives; where the connection between people and the land is at best uneasy and cannot be trusted. In prose of exceptional clarity and elegance, Julia Leigh creates an unforgettable picture of a man obsessed by an almost mythical animal in a damp dangerous landscape. The Hunter is the work of a compelling storyteller and a truly remarkable literary stylist. 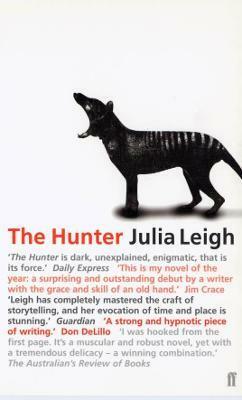 Julia Leigh's debut novel, The Hunter, was published around the world and won numerous awards, including a Betty Trask Award and the 2001 Prix de l'Astrolabe. It was also selected as a New York Times Notable Book of the Year. Her second novel, Disquiet, won the Encore Award. Her film Sleeping Beauty was officially selected for the Festival de Cannes in 2011.